Even though smart TVs are easily available these days, they’re worth quite a fortune. Also, they are usually underpowered and quickly outdated. And if one really wants to keep his budget in check, replacing a TV just for a few added features isn’t the way to go. This is where devices like Stream Team’s onD Android TV Box are an absolute treat to have. The onD Android TV Box is an Android-powered set-top box that converts your TV into a smart TV. There are tons of features packed into this small device that we’re going to talk about in this jam-packed review. So, without further ado, here’s our full onD 4K Android TV Box review. Similar to every other product, the onD Android TV Box by Stream Team comes with some pros and cons of its own. However, the pros heavily outclass the cons. But hey, not everything’s perfect, right? So here are some pros and cons that you need to keep in mind before you wander off to buy the product right away. We’ll be elaborating on each of the pro and con later in the review, discussing why you should or shouldn’t choose the onD 4K Android TV Box by Stream Team for your TV. As you can see, there are tons of different things that set this product apart from all of its competitors. Where some pros are amazing and clearly help the onD Android TV Box win the debate, some cons push the product right back into the race with its competition. Let us discuss further on why the onD Android TV Box is just what you need. Before reviewing any other product, we love to make it clear who the buyer of the product should be. Why do we do this? Well, it’s simple. When a company launches a product, there is always a target market for it. Regardless of what the product is, the manufacturers always have in mind what kind of people they’re targeting for the product. So, let’s talk about the onD Android TV Box by Stream Team and who should buy this product. The onD Android TV Box by Stream Team is built for users who are satisfied with their current televisions and don’t want to switch to a new one. This little box allows you to enhance your current living room entertainment setup. It allows you to stream movies and TV shows, surf the web, as well as playing games on your existing TV. In addition, the price tag of the onD Android TV Box by Stream Team is quite low as compared to other competitors in its league. What this clearly means is that the onD Android TV Box by Stream Team is a device for users who are on a budget yet want to buy a high-end device that can transform a TV into a smart TV. With the functions that come with the device, it is clear that the product is for someone who aims to upgrade their multimedia experience at a reasonable price. If you are someone who is looking for smarter solutions at a very competitive price, the onD Android TV Box by Stream Team is just the thing you’re looking for. Now let’s discuss this product in further detail to help you explain what it actually is. The onD Android TV Box might come with a small price tag. But the specifications are very competent as compared to the other smart TV devices on the market. In fact, it just might be the best budget deal that you could possibly get around this price tag. It is clearly a grade-A product with specifications that rule the charts. The onD Android TV Box by Stream Team comes with a powerful CPU and GPU pairing. It is powered by a quad-core Amlogic S812-H processor that works seamlessly without any distortion. Streaming 4K resolution videos requires a lot of processing power. But that is not a problem anymore with this device as it causes no trouble while streaming your favorite shows. With 16 gigabytes of storage, you can easily store your favorite seasons, videos, movies and music without having to worry about running out. A 2 GB memory also helps accelerate each process so that there’s no problem in seamless streaming or gaming. Just when you think the list of specifications is finished, we prove you wrong as there’s a lot more that this device comes with. It comes with an easy-to-use interface that even a newbie can easily operate. This is one thing that sets it apart from all of its competition on the market right now. Another thing that the onD Android TV Box by Stream Team is great with is add-ons. Inside the box, there is a Pro Air Mouse, a 3-in-1 Rechargeable Remote that includes a Keyboard, Mouse and programmable IR functions. Let’s now move on to what the onD Android TV Box by Stream Team comes with inside the box. Since the price tag for the onD Android TV Box is unbelievably budget friendly, users assume that it must be a standalone product. But hey, you’re in for a sweet surprise. The onD Android TV Box comes with tons of things when you unbox it. Inside the box of the onD Android TV Box, you’ll find a Pro Air Mouse that’ll allow you to switch between apps and features pretty quickly and easily. The Pro Air Mouse replaces the taps you make with your fingers on your smartphone and helps you easily glide and click on different areas on the UI without going through any sort of trouble. 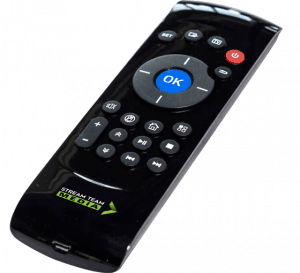 This 3-in-1 rechargeable remote also includes a keyboard and basic IR functions. This means you’ll always be in control of the device without using both of your hands. As mentioned earlier, the remote is a rechargeable device and should give you enough time for 2-3 streaming sessions after 1 complete charge. Other than these amazing add-ons that come in the box, there is also an instruction manual for newbies if you ever face trouble using the device. It’s highly unlikely you’ll ever get to face any troubles with it, though, as the UI is pretty easy to use. Let’s discuss the UI and the product in detail for the product. The product design and its user interface are two of the most important things that a user needs to focus on. Lucky for you, the onD Android TV Box by Stream Team wins in both the departments. Even though the onD Android TV Box comes jam-packed with features, it is perhaps one of the most compact devices that are fit to be a part of your room. The small device can be placed anywhere easily. It is roughly the size of a normal book and fits perfectly in your existing TV setup, even if you’re low on space. Furthermore, this device is black in color and looks gorgeous paired up with just about any TV. Now let us move on to the UI of the device. The device comes with a gorgeous UI, which is easily one of the best on the market. As mentioned above, the interface is very easy to use, even for newbies. Hence, this device is something that you won’t have any trouble using. Fond of apps? Well, then the Kodi app and the Stream Team Market app are the perks that you’ll enjoy in this product. Also, since the TV box runs on Android, you can choose from millions of apps on the Play store. All in all, it’s a great product for novices and experienced users alike. The list of features of this device is very long and has been repeatedly made a part of this article. However, there are tons of notable features that we haven’t mentioned yet. Dual-band Wi-Fi support is one of the excellent features that tops the list. When you want to stream your favorite shows in 4K resolution, it requires a 5GHz wireless internet connection to ensure smooth playback. This is where the onD 4K Android TV Box by Stream Team plays an integral role. It allows you to watch your favorite shows without any hassle. Other than this, OTA updates and customer support are noticeable additions to the feature list that’s already huge. This ensures that you always run the latest software. Also, this gives you plenty of options to stream movies and TV shows. No tracking down of streaming links and add-ons requried. And should you ever experience any issues with your device, Stream Team is there to assist you. They even provide remote connection assistance. Stream Team will access your box remotely and fix any software issues you might have. The onD Android TV Box by Stream Team is an excellent device when it comes to performance. The 2 GB memory and the quad-core CPU ensures top-notch performance, even when streaming high-end 4K videos. The video output quality is excellent and obviously requires a mind-blowing GPU to back up the performance. The Octa Core GPU also provides plenty of power for even the most demanding apps. 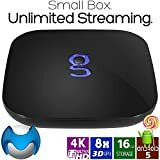 Performance, all in all, outshines many of Stream Team’s competitors and you will love watching your favorite video content through this TV box. We mentioned the 3-in-1 remote in this review before. It is quite easily one thing that sets apart Stream Team’s onD Android TV Box from other set-top boxes on the market. 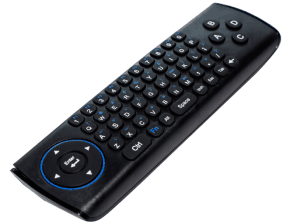 With all the features that a keyboard and a mouse need along with a few additional features such as IR functions for the device, the 3-in-1 rechargeable remote is an excellent solution for you to use your streaming device. Analyzing the customer’s reviews is an essential part of our review process. Each time we review a product, before recommending you to buy it, we focus on customers’ experiences. Customer experience matters a lot since we focus on quality. Some devices may be great on paper. But when put into personal use, it can be a problem and not live up to the hype it created. We analyzed and summarized the onD Android TV Box by Stream Team. According to the majority of customer reviews on Amazon and other marketplaces, the product is an excellent choice for you. All in all, the onD Android TV Box is a beast of a device. It serves the market as a budget-friendly yet feature-packed streaming device. Together with both hardware and software qualities along with a very reasonable price tag, the product is an excellent selection for you or your loved ones. You will find cheaper set-top boxes, such as the Matricom G-Box Q2. But the onD Box easily outshines the G-Box in terms of performance and user friendliness. If you’re someone that’s looking to transform your TV into a smart device, the onD Android TV Box is undoubtedly the best choice. The device gets a solid 4 out of 5 stars for its features and add-ons. Get the onD 4K Android TV Box by Stream Team today and enjoy all the benefits it has to offer. 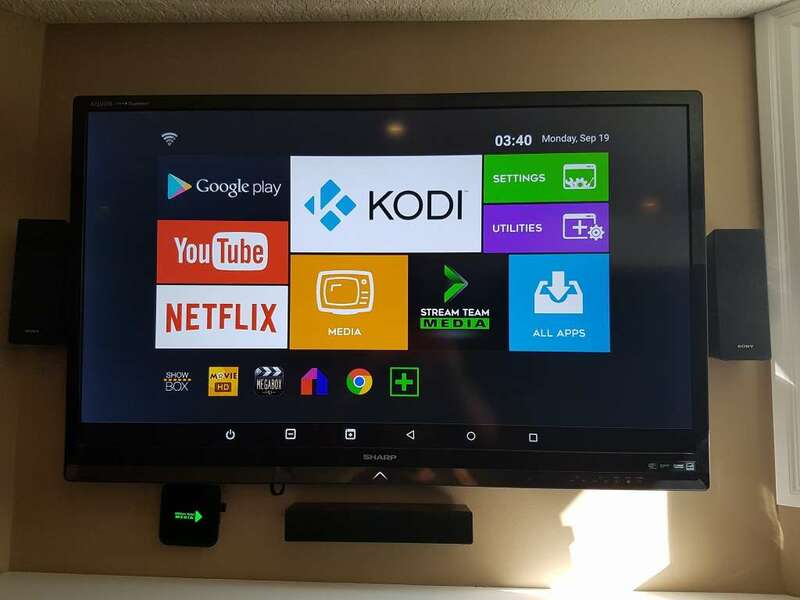 Users looking for an Android box that will replace their existing cable subscription might be better off with a fully-loaded Android TV box. These devices are more expensive. However, they give you access to countless live TV channels and movies, without having to pay monthly fees. 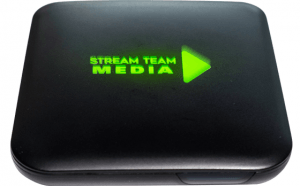 Our top picks are the SkystreamX (Review) and the Rveal Streaming Media Player (Review).